BBC NEWS | Asia-Pacific | Will Japan re-elect its hereditary politicians? Will Japan re-elect its hereditary politicians? Will voters sweep a new generation of politicians into power? Many of the names on ballot papers for Japan's 30 August general election will be very familiar to voters. America has the Bushes and the Kennedys, India the Gandhis, but in few countries is politics such a family affair as Japan. A large proportion of candidates in this election are running in constituencies where their forefathers served before. Around a third of the candidates from the ruling Liberal Democratic Party (LDP) are running in seats previously held by a family member. For the main opposition Democratic Party of Japan (DPJ) the figure is around 10%. The leaders of both parties are from political dynasties. One candidate, Katsuhito Yokokume, is trying to make a virtue of his humble origins. He is using his old red bike to campaign for parliament in Yokosuka, a seaside city not far from Tokyo. Wearing a DPJ sash as he rides around the streets, the lorry driver's son, who graduated from Japan's top university, bows from the saddle to everyone he sees. But he will struggle to become as well known as his opponent. Getting a much bigger reception on the campaign trail is Shinjiro Koizumi. He is also in his 20s, but his candidacy is causing real excitement. Hundreds of people turned out to see him make his first speech of the campaign from the top of a van. 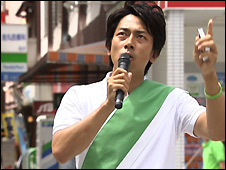 Election workers in green polo shirts printed with "Team S 2009" marshalled the crowd. In Yokosuka, Shinjiro Koizumi is like a favourite son - middle-aged women grab his hand as he walks through the streets. That is because his father is Junichiro Koizumi, a charismatic former prime minister who has represented the city in parliament for years. "I really like his father, Junichiro," said a woman hurrying to catch a train. "Because he's his son, I'm sure he'll do something for us. I'm expecting great things from him. My husband is too." "I like Mr Koizumi and a lot of local people are Koizumi fans," added a man who was out shopping. "For sure he'll win." The leaders of both main parties, Prime Minister Taro Aso and DPJ leader Yukio Hatoyama, are political bluebloods, carrying on a dynastic battle. Back in the 1950s the grandfather of Mr Aso was succeeded as prime minister by Mr Hatoyama's grandfather. But there is growing concern in Japan about the dominance of dynasties and whether the power of local political machines built up by families stifles the chances of new blood getting into parliament. The issue was thrown into the public spotlight by the successive resignations of two prime ministers, Shinzo Abe and Yasuo Fukuda, the grandson and son respectively of former prime ministers. Both lasted in office for only a year and their decisions to quit were criticized as a sign of the weakness of hereditary politicians. "They have money, they have supporters and they have name value handed down from the parents," said Noriaki Tsuchiya, the deputy director of the Matsushita Institute of Government and Management. "This is not good for Japan because [the] dynamism of political power is not [as] strong as other countries." The Matsushita Institute was set up by the late founder of the electronics giant Panasonic to train promising young people hoping for a career in politics. The aim is to develop a new breed of leaders, without family connections but with plenty of old fashioned Japanese virtues. Students practice the martial art of Kendo - wooden sword fighting - and meditation, as well as holding debates and writing theses. 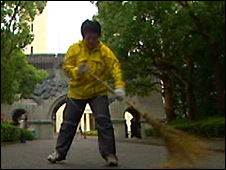 At dawn every morning they sweep the grounds, a taste of humble tasks on their way, they hope, to high office. Back in Yokosuka, Shinjiro Koizumi is playing down his heritage - his grandfather and great-grandfather were parliamentarians too - telling supporters his father the former prime minister won't be joining him on the hustings. "I get criticism every day for succeeding my father's seat," Shinjiro Koizumi told the BBC. "I want to overcome the criticism of hereditary politicians and fight against the strong headwind to win." Katsuhito Yokokume, the lorry driver's son, is also hoping he will emerge victorious when the votes are counted. But he likens the contest to an ant taking on an elephant.